There are many benefits to incorporating massage into your routine. 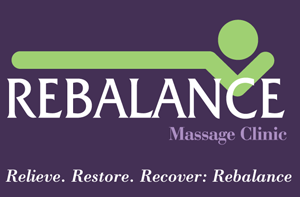 Rebalance’s therapeutic massage services incorporate various modalities depending on each individual’s needs. Our therapists will work with you and choose the best methods that will help reach your session’s goals. Aromatherapy (Add-on to a massage) - $10.00. This includes a scent of your choice for during the massage and hot towel on the back at the end. To get the most from MLD, the ideal protocol is 5 consecutive days, 50 minute sessions each. A typical session for MLD is 50 minutes. This type of massage helps the body improve it’s ability to heal itself and is great for so many conditions such as concussions, pre and post surgery, reduce cellulite, reduce edema and much more. Prenatal massage can help reduce aches and pains associated with pregnancy. There are many benefits to getting a prenatal massage. This is our most popular program!! 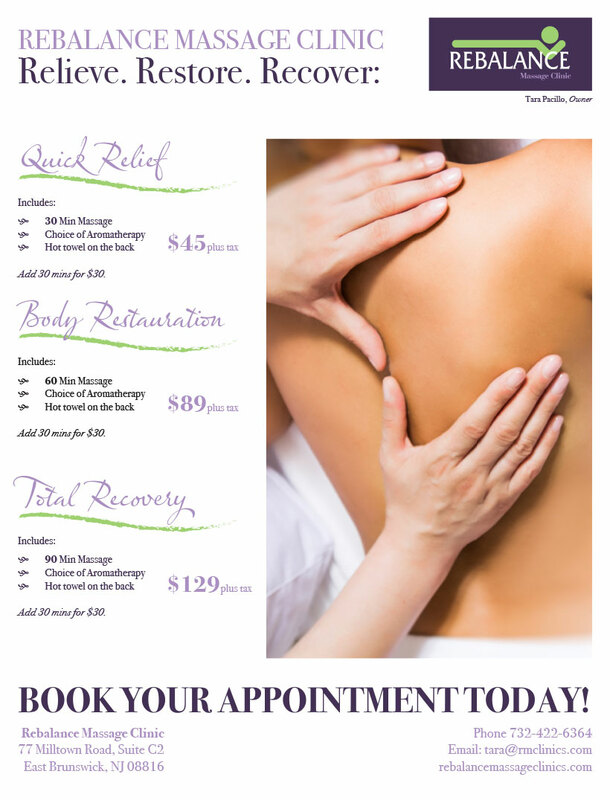 Receive one massage a month to alleviate your aches and pains. Our Massage Club is a month to month commitment and is the most way to affordably get regular massages. $67 (plus tax) and $19.99 one time admin fee. With this program, get 3 massages to use in a 12 month period. $237 plus tax. For our corporate clients and individuals who like to have chair massage at their parties, we offer chair massage services. It’s a great addition to health fairs, boost office morale, and parties! Call us for pricing! AromaTouch is a 35-40 minute session which uses the powerful combination of essential oils and light touch to provide an amazing experience that is beneficial to our overall well-being. AromaTouch uses 4 essential oils and 4 essential oil blends to promote relaxation, strengthen the immune system, reduce pain, and invigorate the nervous system. The oils are applied only to the neck, scalp, back and feet. Introductory price: $56/session (Regular price $75) This price is for either adding to a session or having a stand alone AromaTouch appointment. Sales tax will not be charged to those individuals with prescriptions from their doctor. We require a credit card to hold all appointment times. Cancellation policy: You will be charged full price for the session if you no show your appointment.